The good thing about this mousse is that it's really light, so it would work well as the finish for a heavy meal, as long as you don't overindulge. The bad thing is that I could eat a whole lot of this if I was left alone with a batch of it. Soooo good. Next time I might amp up the lemon flavor, but I'm a lemon fiend. As it is, this is reminiscent of a lightly lemony, but very fluffy cheesecake filling. You can taste the cream cheese as well as the lemon. And although the theme of this book is desserts in jars, I could see using this as the filling for a pie. Maybe spooned into little puff pastry cups. Lots of ways to use this besides a straight-up mousse-and-spoon. The odd thing about this recipe was that when I made it, I ended up with a LOT more than the recipe suggests. The recipe says it makes six 4-four ounce servings. I ended up with 14 4-ounce servings. I double-checked the measurements in the recipe, and I got it right. Maybe mine was frothier and lighter than normal, but that's okay. Just be forewarned that if you make this, you could end up with a LOT more than you expect. I didn't bother with the garnish. Berries aren't in season right now. Fresh pineapple would go well with this, but it's not as stunning, photo-wise. Combine 2 tablespoons water and lemon juice in a small bowl and sprinkle the gelatin over the top. Let rest for five minutes. In a large bowl, beat the sour cream, cream cheese, and lemon zest together until fluffy. In a small saucepan, heat the 3/4 cup of water, and 1/2 cup of sugar (reserve the remaining 1/4 cup sugar) over medium heat, stirring as needed, until the sugar is dissolved. Remove from the heat and pour it over the gelatin. Stir until the gelatin is completely dissolved. Add the gelatin mixture to the sour cream mixture, and beat until incorporated. In a separate medium bowl, whip the heavy cream with the reserved 1/4 cup of sugar until you have stiff peaks. Fold the whipped cream mixture into the sour cream mixture. Spoon the mixture into jars, cover, and chill until firm, about 2 hours. Spoon the fruit (if desired) over the top and serve. 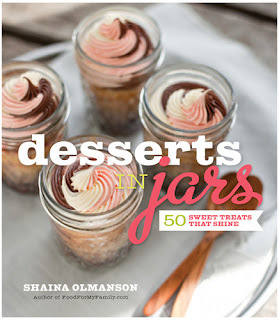 Want to win your very own copy of Desserts in Jars? I got one for ya. 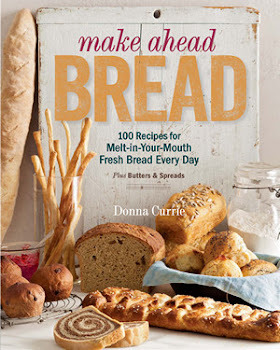 Just leave me a comment about why you want this book. Pin any photo from this post to Pinterest and leave a comment here telling me you've done so. Tweet a link to this blog post. Make sure you include @dbcurrie in the tweet. Come back here and leave a comment telling me that you tweeted. And that's it. Three possible ways to enter. Usual Cookistry rules apply. Contest ends on January 4, 2013 at midnight Mountain time.